Welcome to Carleton Cove Resort on the pristine shores of Paradise Lake, just minutes from Mackinaw City and Mackinac Island, Michigan. Please get to know the resort, and the area, by spending a little time on our site. Hopefully you will want to spend some time at Paradise as well. Our resort consists of three beautiful cottages nestled on about 200 feet of private waterfront and a large green area. Our cabins range from 750 to 1250 square feet excluding their enclosed porches, which add another 200 feet of living space. Each Unit comes complete with a full kitchen and bath, a living room and multiple bedrooms. They also come equipped with bedding, cooking utensils, microwave and service for 8 or more. For more details please click here. 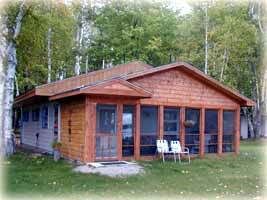 The lake is approximately 2000 acres and is excellent for fishing Northern and Bass as well as Walleye and Perch. It is also a great recreational lake with skiing and jet skis. On our docks we have a couple of newer 16-foot boats for you to use for free. We even have a canoe and paddled boat. If you have your own boat, there is a free DNR launch ramp just across the lake from us and we have plenty of dock space for all. Best of all is our location. If you decide to venture about, you are only 15 minutes from beautiful sand duned beaches of Lake Michigan or the more rocky Lake Huron. 10 minutes from Mackinaw City and the ferries to Mackinac Island, and 20 minutes from Wilderness State Park and the new Head Lands County Park. Some what farther, but still within a hour or so, is Drummond Island, Petoskey, Cheboygan and the inland waterway, Indian River and Sault Ste. Marie with its locks. Plus gambling casinos are as close as St. Ignace, Petoskey, Brimley and the Soo! We believe you'll enjoy the resort as much as we do. And when you rent from us, it's your place. We just hope you feel like it's your home away from home. If you have any questions or to arrange for time please contact us.